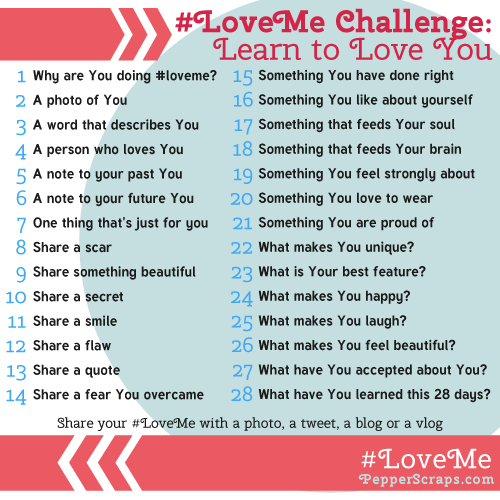 Being Frugal and Making It Work: February #LoveMe Challenge: Day 6! Have you ever wished you could look ahead and see what the future has in store for you? If you could take a peek, would you want to know what the future holds?. Day 6 of the #LoveMe Challenge is to write a note to yourself in the future. WOW!! Look at you. You have come so far... you accomplished what you set out to do in life. You have a beautiful family - a loving husband and two wonderful, smart, bright, respectful children. You tackled your weight loss and self-esteem issues head on (and even though you struggled at times), you were able to lose the weight, keep it off, and become a stronger, better version of you! If you could go travel to the future and give your self one piece of advice, what would it be?